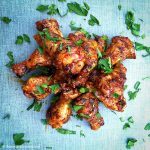 I love all sorts of chicken recipes and I like all parts of the chicken. 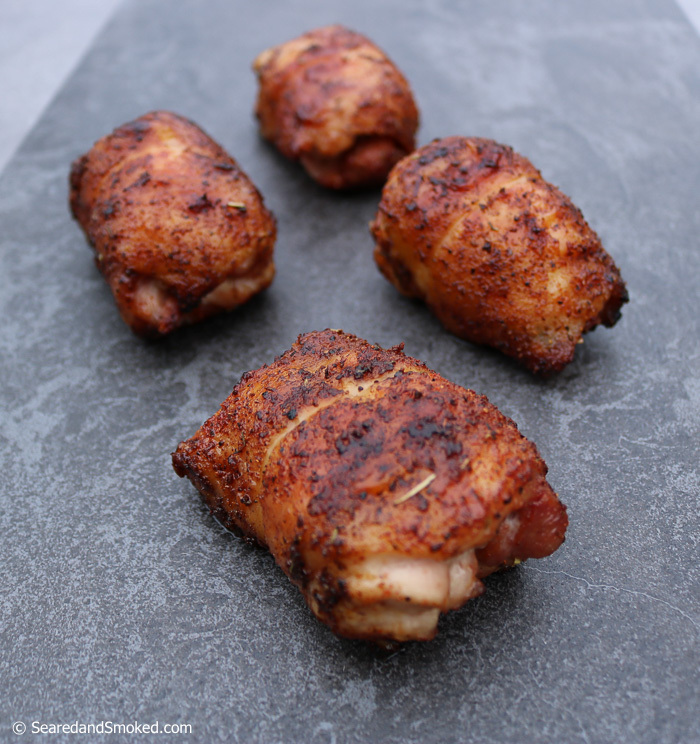 One part of the chicken that gets a bad wrap outside of the BBQ world, is the chicken thigh. People just don’t understand how delicious a well cooked thicken thigh can be. Today, we are going to fix that entirely. 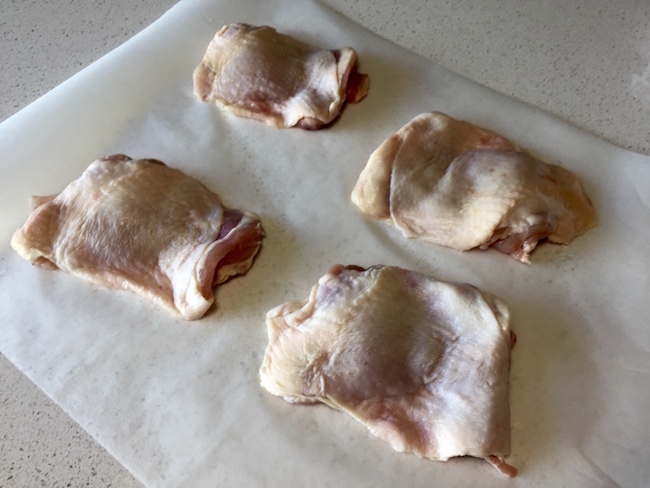 By removing the bone and slow cooking these Chicken Thighs, we are going to create crispy on the outside, tender and juicy on the inside Smoked Boneless Chicken Thighs. 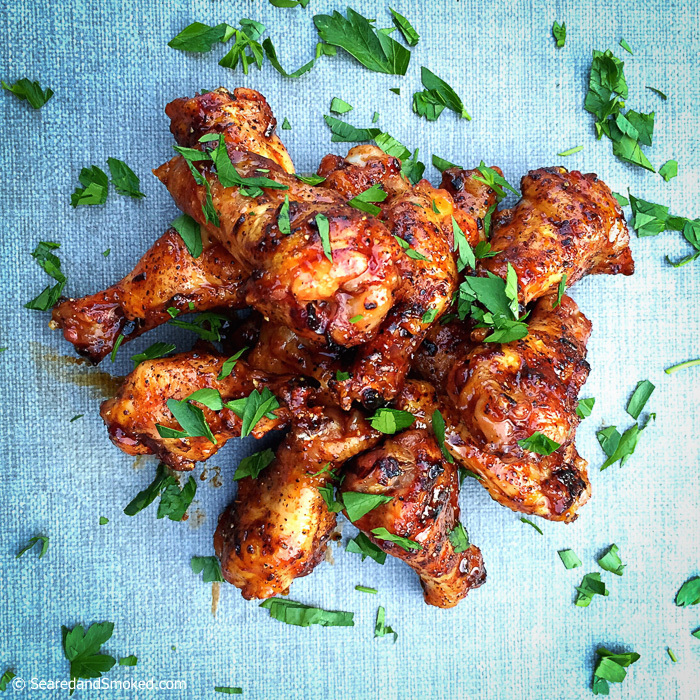 They are great for serving as a main dish or a starter for an all out BBQ smorgasbord. 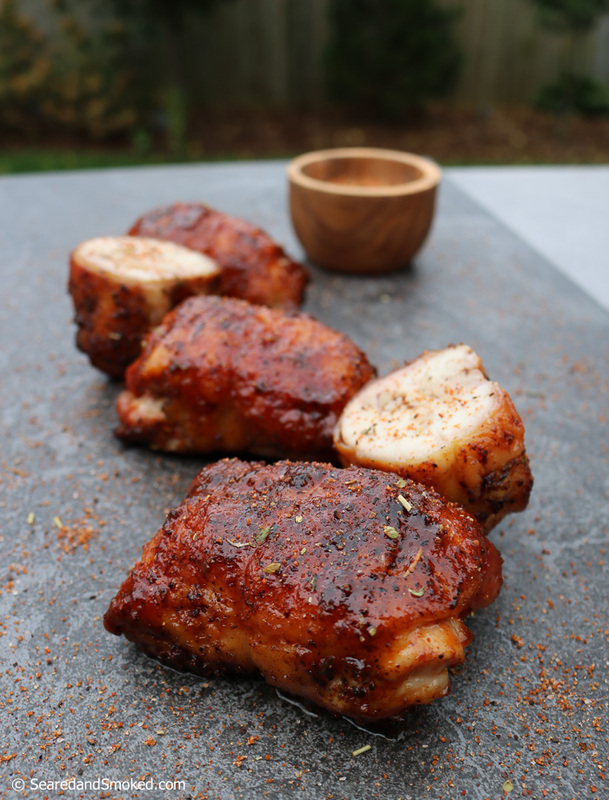 You can also use this same recipe for bone-in chicken thighs. 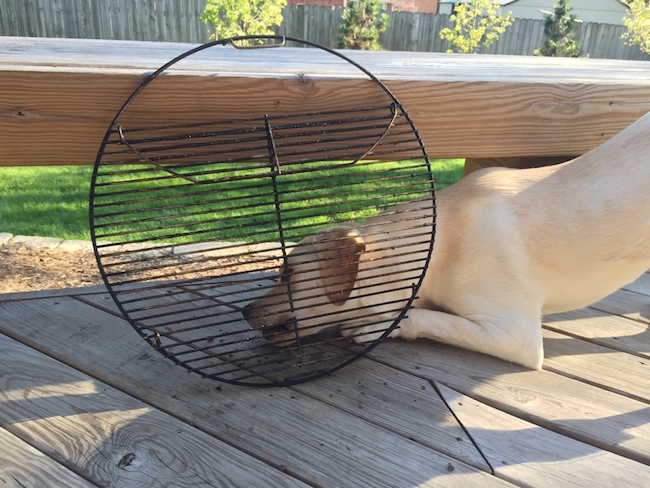 Use this exact same process if you do not want to mess with the bone. The process is really easy. 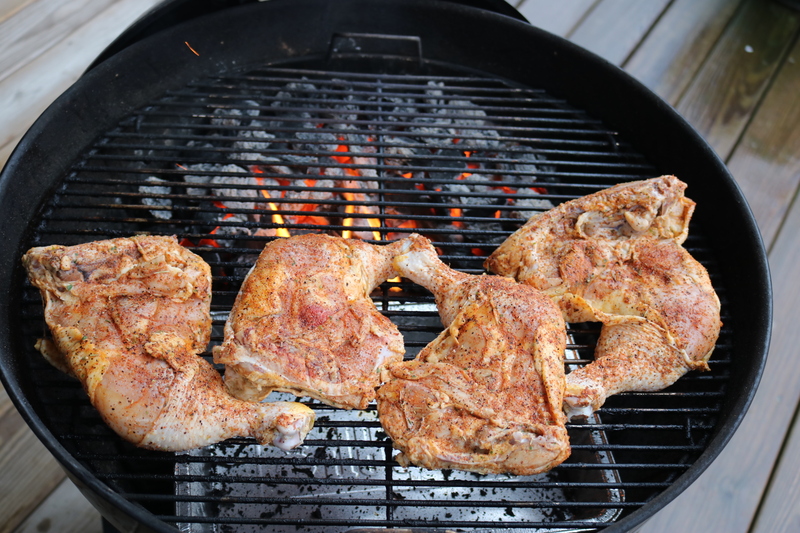 While prepping the chicken thighs, setup your grill or smoker for indirect cooking and bring the temperature up to 350 degrees. 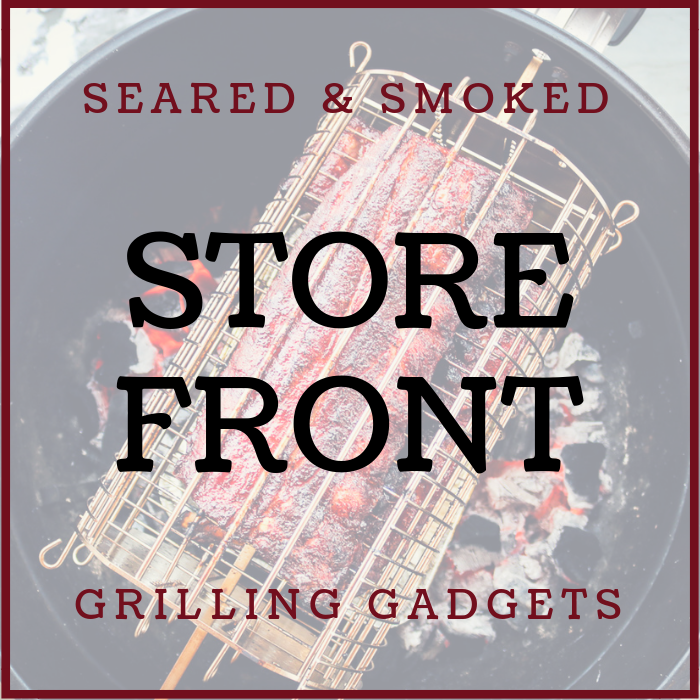 If needed, give your grill grate a good cleaning as well…. thanks Booker! Then remove the bones from the chicken thigh using a sharp knife that is not too big. I prefer a boning knife. 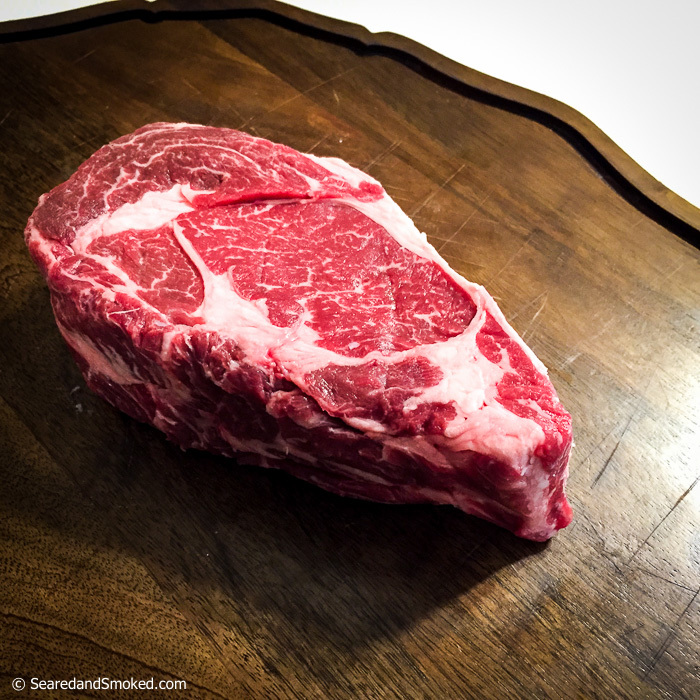 Simply start by cutting down to the bone from the skinless side of the thigh and then start slicing both sides of the bone and scraping the flesh off of both sides of the bone, until you can pull or cut the bone out. Then check for any rough inedible surfaces you might need to cut off. 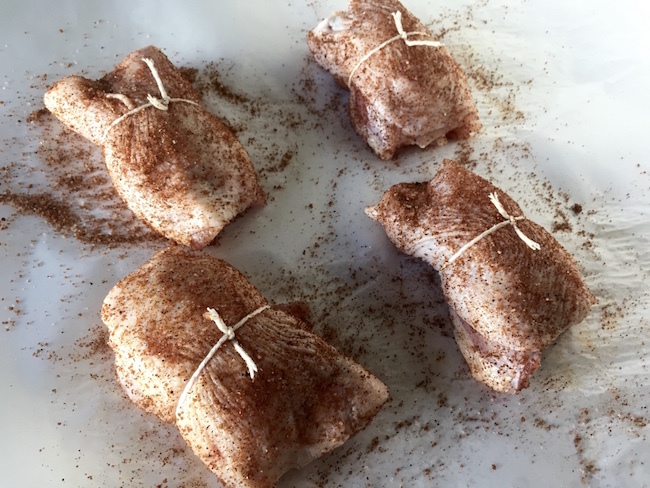 After removing the bone, season both sides of the chicken thigh liberally with one of my favorite rubs. Then tie them up with butchers twine. 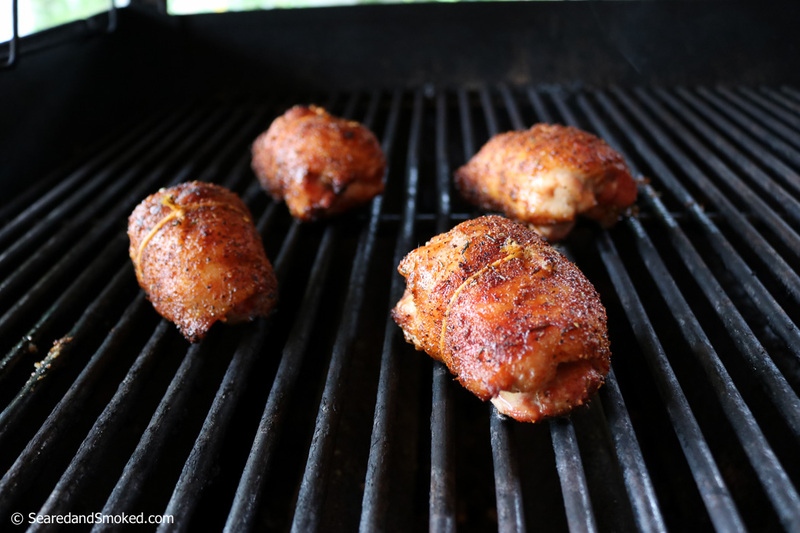 By tying them up, the chicken thighs will become little rolls of crispy tender deliciousness. Season again after tying them up if needed. You want a nice even coating of rub all over. 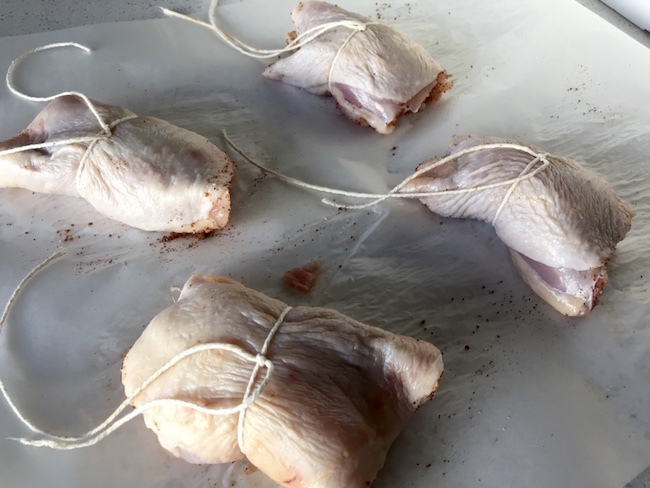 Tie the chicken thighs up so they are slightly snug. They will firm up as you smoke them. Then cook them at 350 F for one hour over indirect heat. 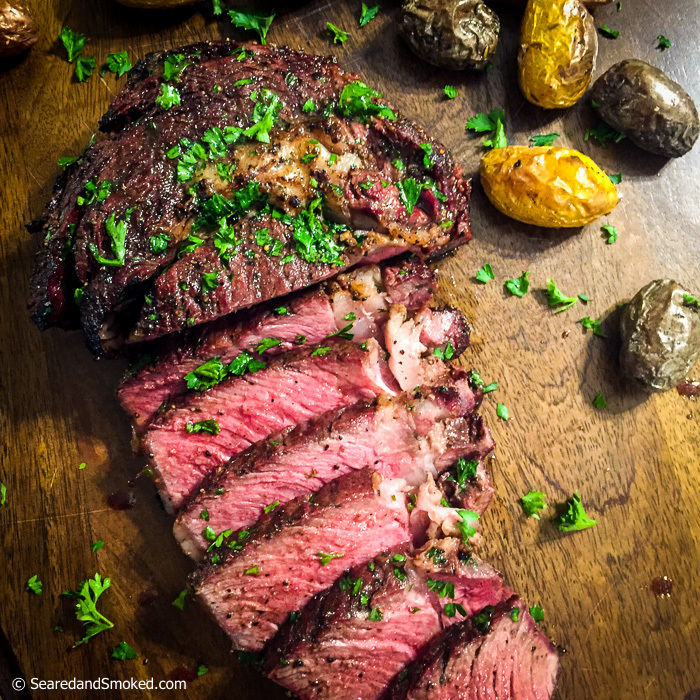 I love using my weber kettle for this recipe. It is so easy to setup for indirect heat and easy to cleanup as well. 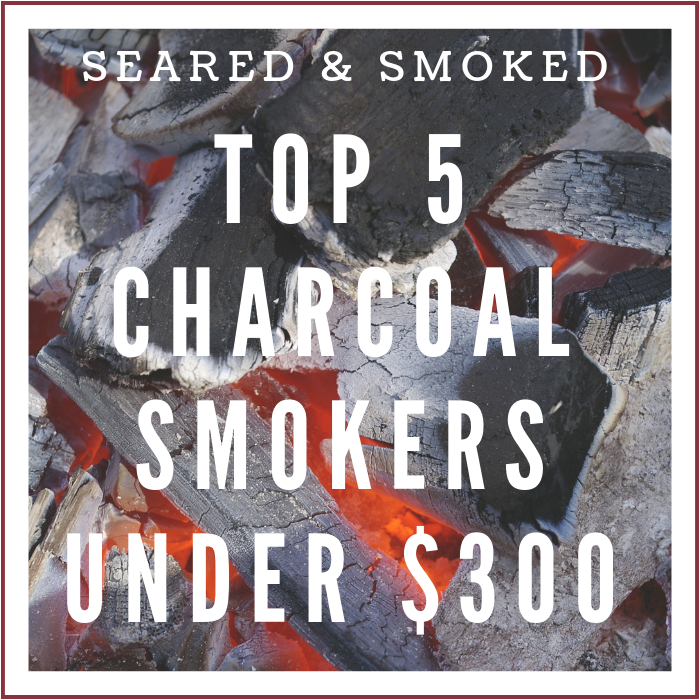 I add a small hand full of apple chips on top of the charcoal to start the cook and then usually let the charcoal do the rest from there. Start skin side up for 20 minutes, flip skin side down for 20 min, then finish skin side up. The skin should be a nice golden brown at this point. 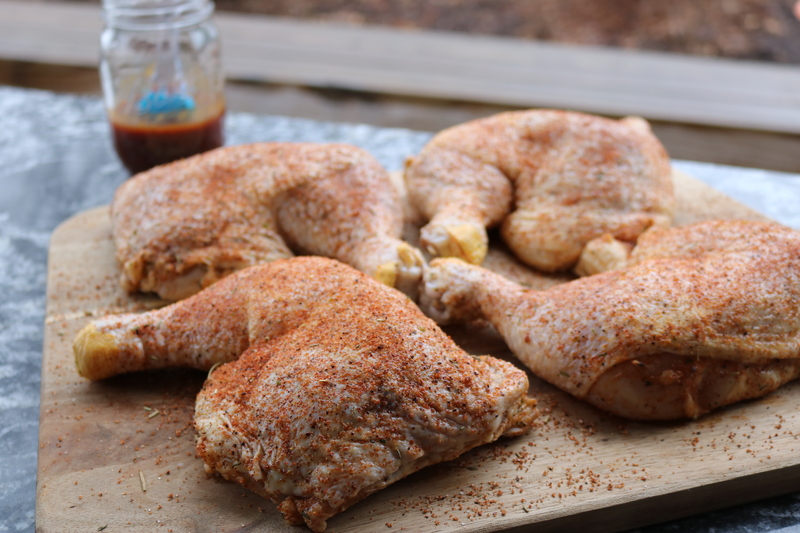 You can check the internal temperature of the thighs and they should be over 150 F at this point. 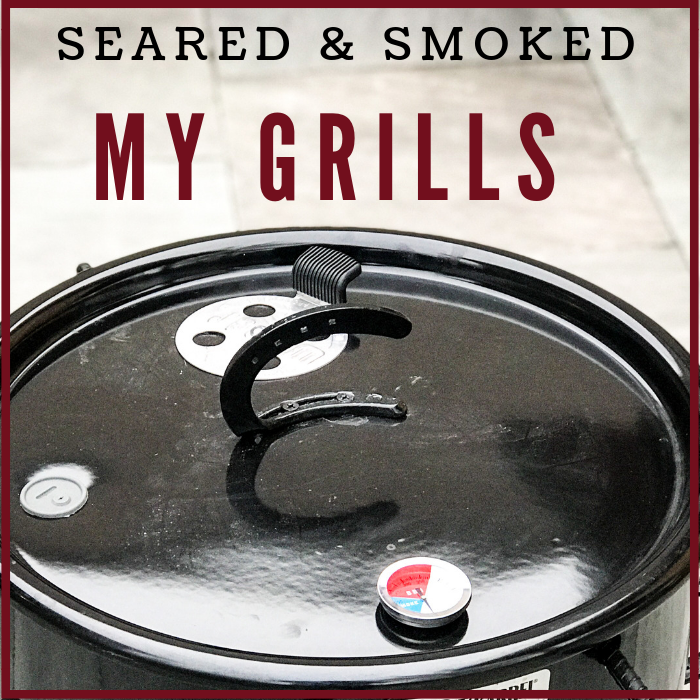 Smoke over indirect heat for about one hour around 350 F. I prefer using a Weber Kettle or Big Green Egg for chicken thighs. 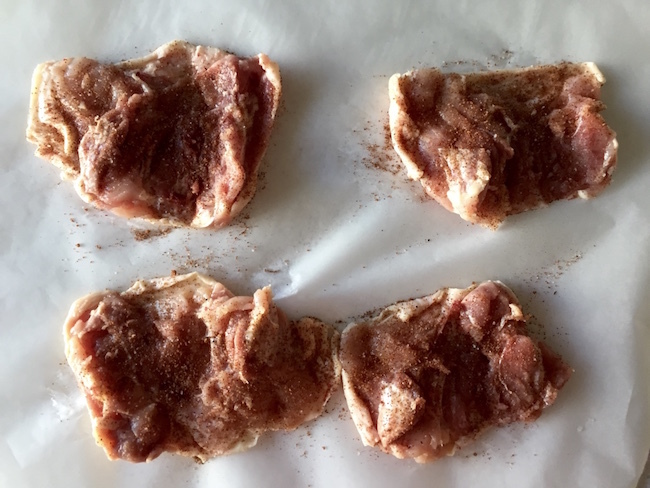 Remove the butchers twine and finish the boneless chicken thighs over medium to high heat. 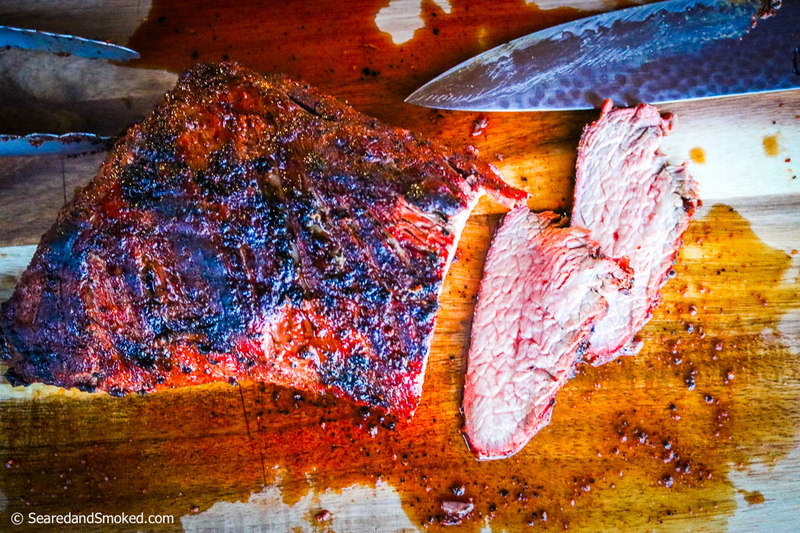 Flip often to crisp the skin without burning. 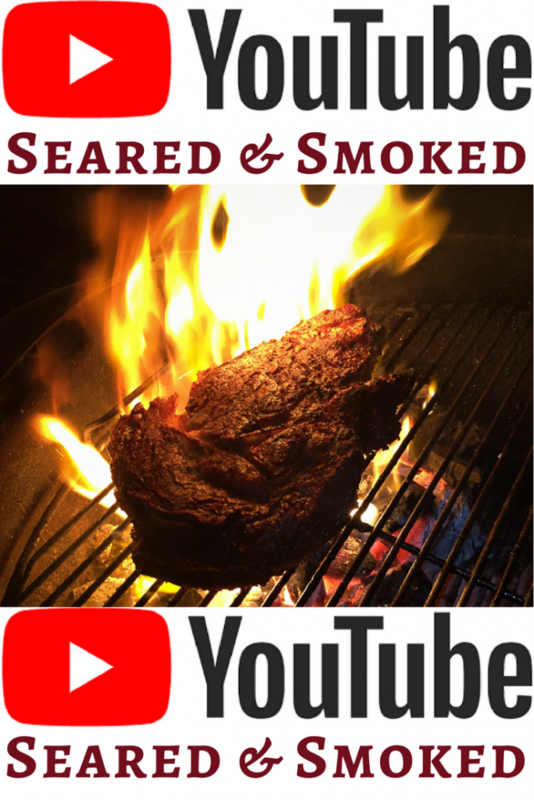 When they have nice color and the skin is starting to crisp up, place them directly over the coals or move them to your gas grill if you have one over medium high heat. 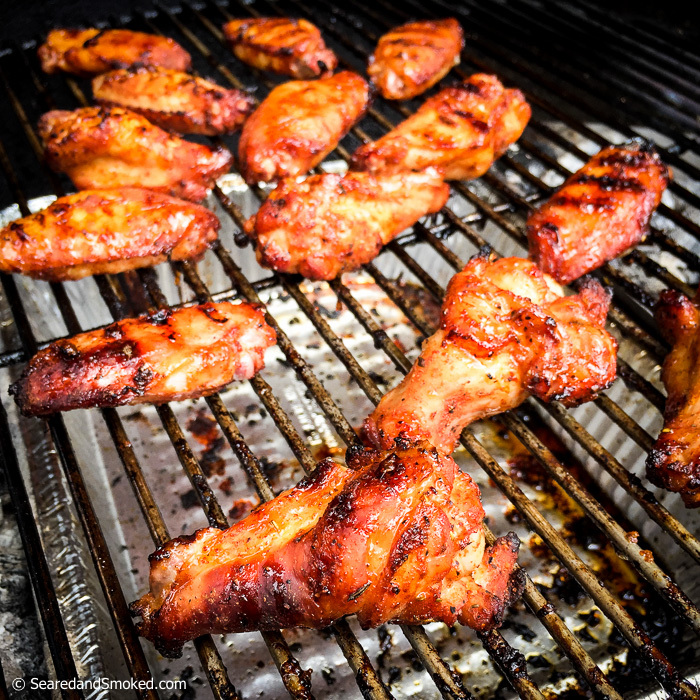 You want to flip them every minute or so, grilling both sides of the thigh until the skin becomes nice and crispy. You will end up with little crispy nuggets packed full of flavor. Remove the twine and serve as is, or carefully slice up for snacks. 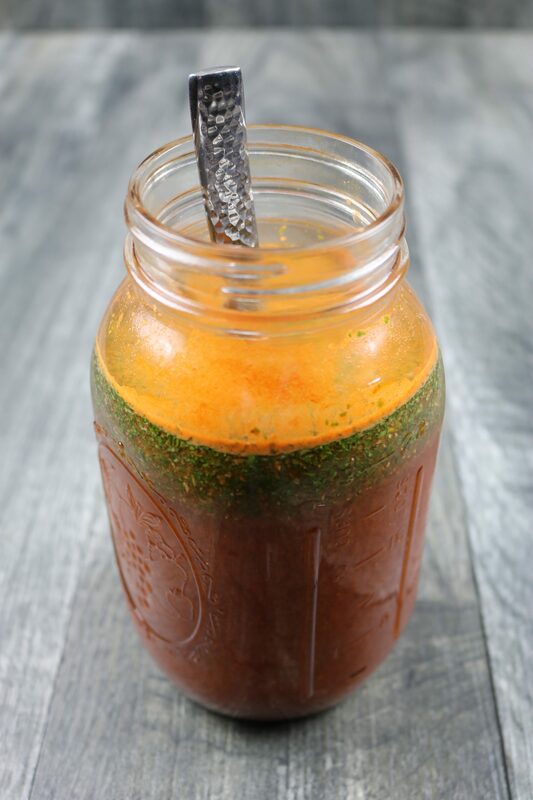 Leave me a comment if you give these a try or have any questions! 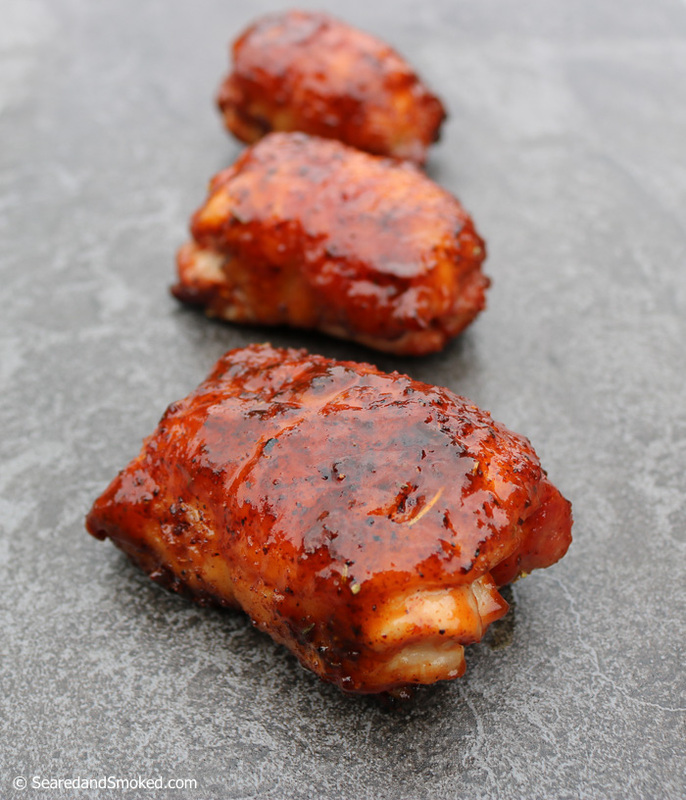 Our beautiful boneless chicken thighs… crispy salty sweet skin and perfectly juicy on the inside. 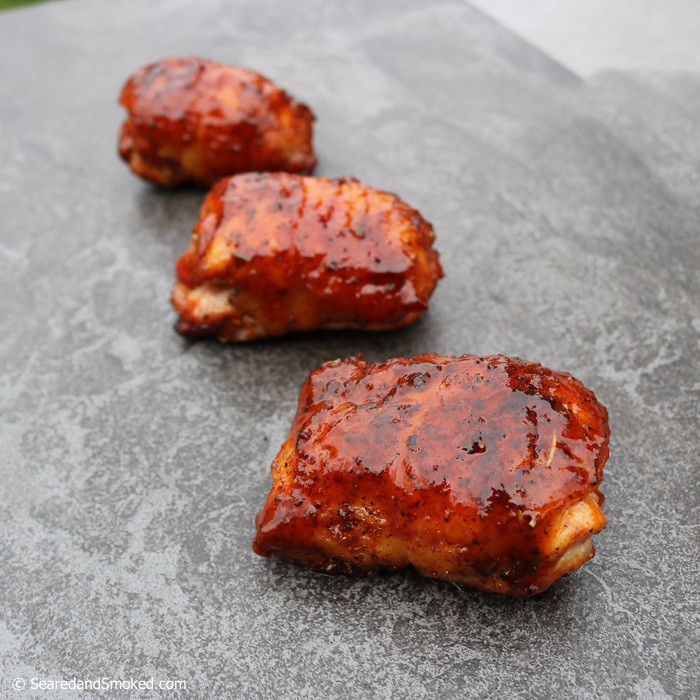 Glaze with BBQ sauce before serving or let the dry rub do the talking. 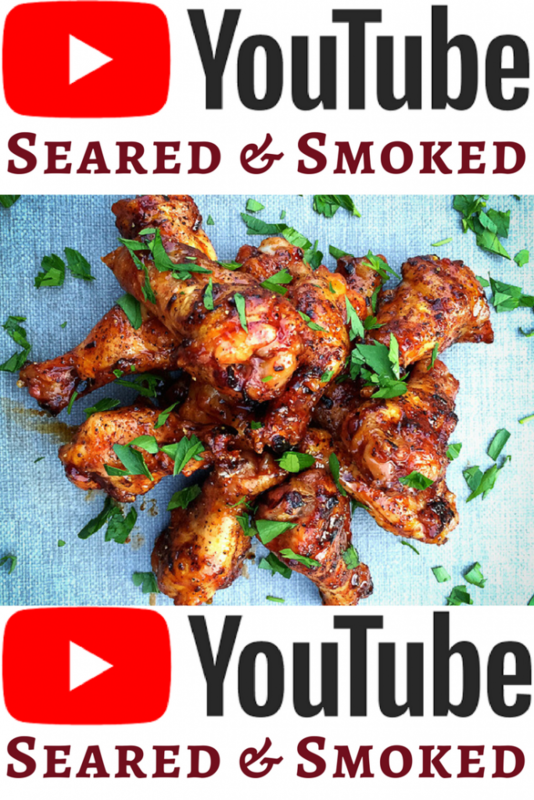 Learn how to smoke perfect Boneless Chicken Thighs with this easy to follow recipe. 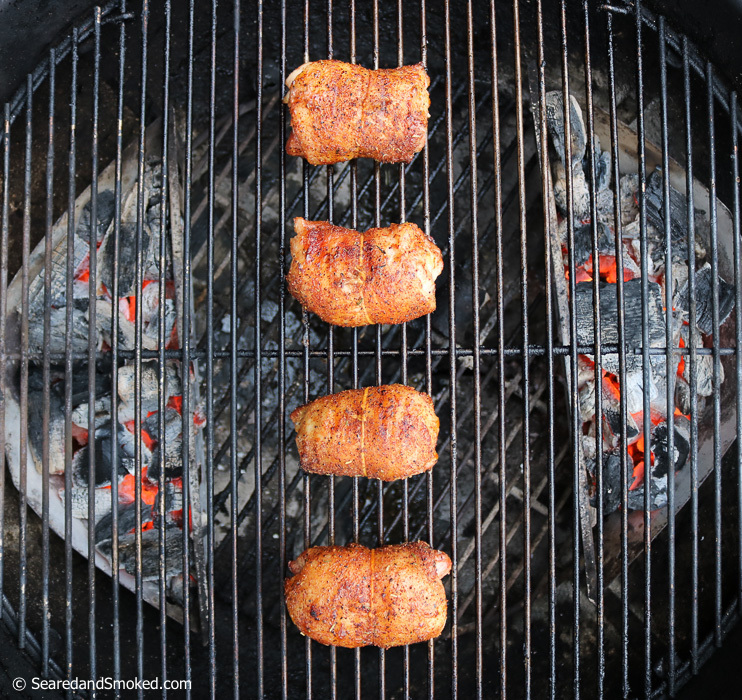 Dry rubbed and slow cooked, these Smoked boneless chicken thighs are an awesome treat for dinner. Check for any rough cartilage after removing bone. Remove if needed. 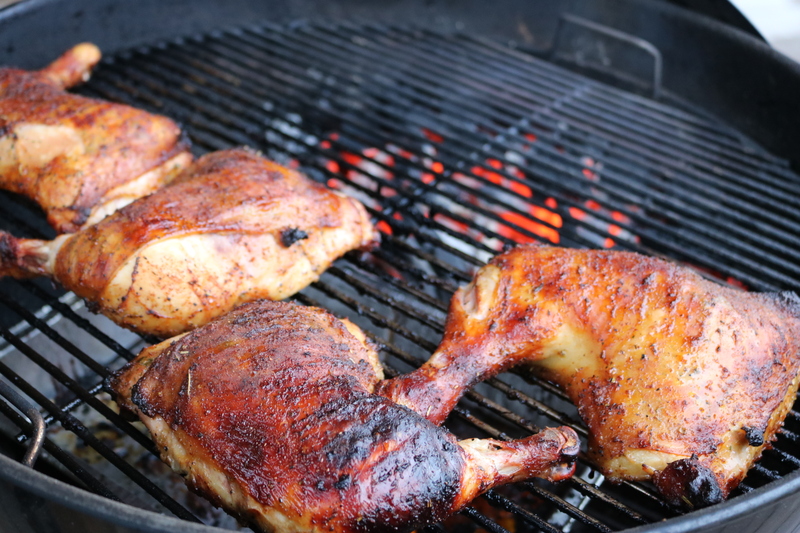 Put a chunk or small handfull of apple wood or cherry wood on the coals before putting chicken on the grill. 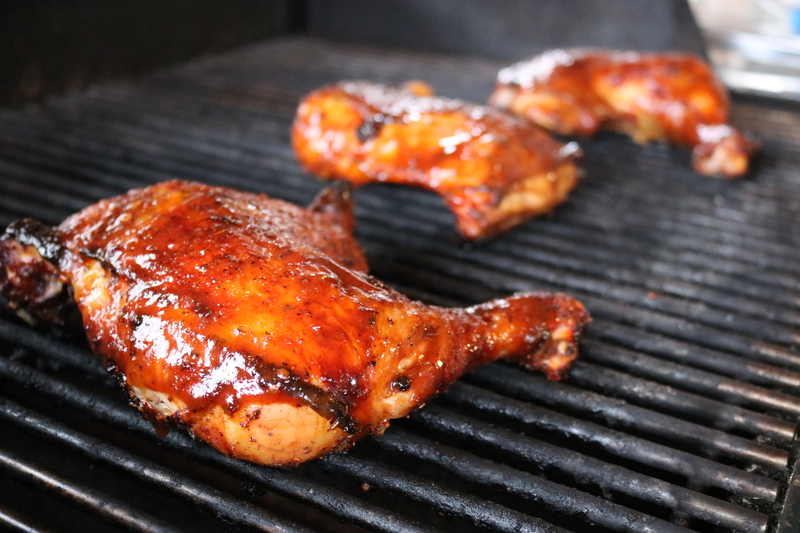 Place chicken on the grill, skin side up. 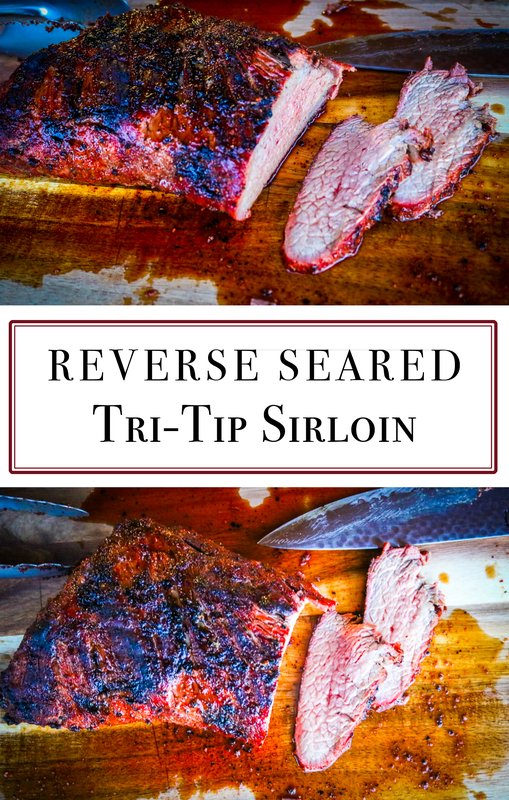 Cook for 20 minutes, then flip skin side down. 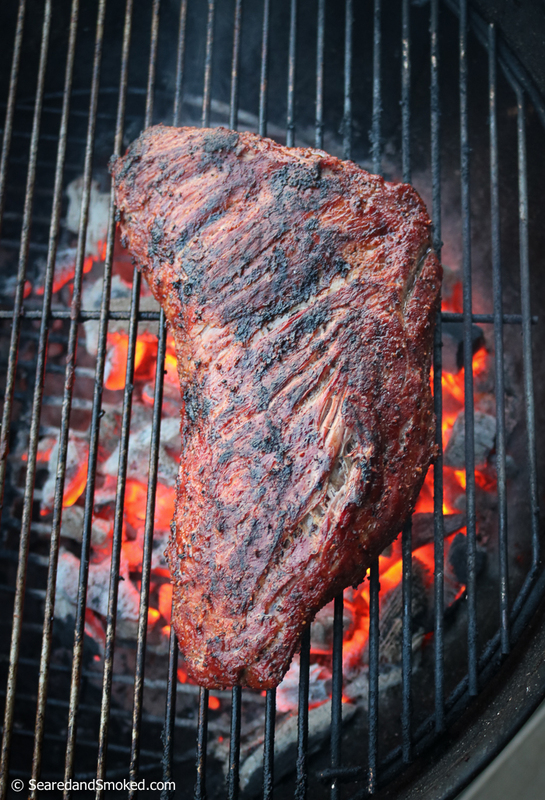 Finish with the skin side up for 20 minutes. Cook for 1 hour or until the skin starts to become slightly crispy. Let cool for 5-10 minutes and serve. 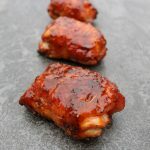 Glaze with BBQ sauce or leave dry if you want to preserve the crispy skin. Cooking time can vary depending on the size of thighs. 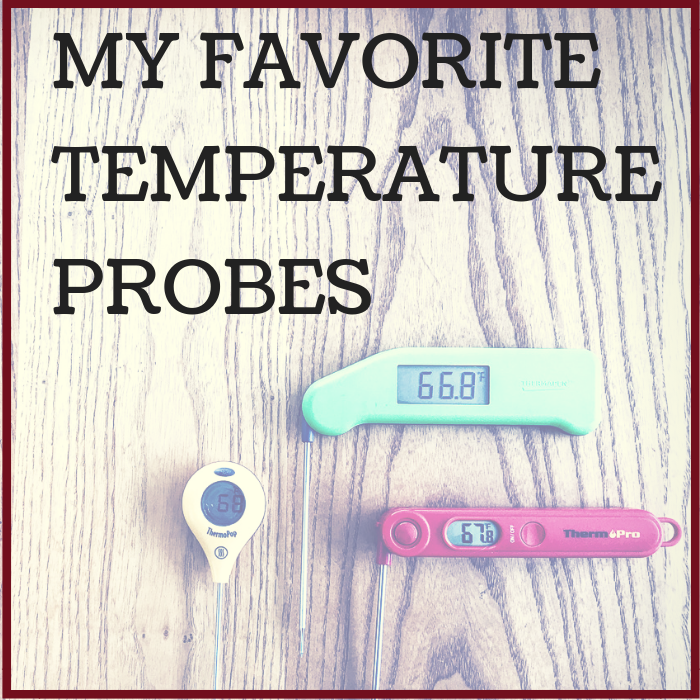 Check internal temperature for 165 F if needed.